Nestled in the Nantahala National Forest, and in the southern shadows of the Great Smoky Mountains National Park, you'll find 'Jimbo's Farm.' It's a 53 acre retreat that includes a 117 year-old restored Farm House with New Metal Roof, one acre trout pond, 2 settling ponds with waterfalls and mountain branch running through the entire property. There are Apple / Pear / Peach / Cherry Trees and Blueberry Bushes in meadow next to Pond. Hughes Net Internet service with wireless router available. Springtime arrives late March, when the old growth trees begin to green and daffodils start to bloom. By summer, dogwood, laurel, wild azaleas and rhododendron are in full glory. Gentle summer temperatures rarely reach 80 F while nights drop into the high 50's. The colors of fall in this rural mountain setting make for the most spectacular viewing. With over 100,000 acres of National Forest, the walking trails along the pristine streams and mountain tops contain one of the greatest varieties of flora found anywhere in the world. Lake Santeetlah covers 2800 acres, with 100 miles of shoreline. Excellent fishing for small mouth bass and large mouth bass, walleye, crappie, bream, and lake trout. Cherohala Skyway; a leisurely and breathtaking drive. This ridge route between North Carolina and Tennessee opened on October 12, 1996 and was immediately acclaimed as one of the most scenic routes in the USA. Spirit Ridge offers the most expansive view along the entire route. The Dr agon: 318 curves in 11 miles on US 129, a scenic driving challenge. Mountain crafts abound with over 500 local artisans. Cherokee Indians are native to the county and make beautiful baskets, beaded items and carvings. Tsali: one of top 10 mountain biking trails in the US. Joyce Kilmer Memorial Forest: the last 3,800 acres of untouched virgin wilderness east of the Mississippi. Old growth trees, some 20 feet around the base, grow in this natural setting and remain in its primitive state. Excellent walking trails wind along this living monument to the memory of Joyce Kilmer, the poet who is best remembered for the poem 'Trees.' Practice your Fly casting skills on your private trout pond before heading off to countless streams. Then visit the famous Blue Boar Lodge, rent a boat and try your luck on Lake Santeetlah. Enjoy the many outdoor activities available just minutes from ' Jimbo's Farm .' Or just stock up, close the gate, and stay in your secluded retreat. Have a seat on the porch and enjoy the quiet, slow paced life of Graham County. 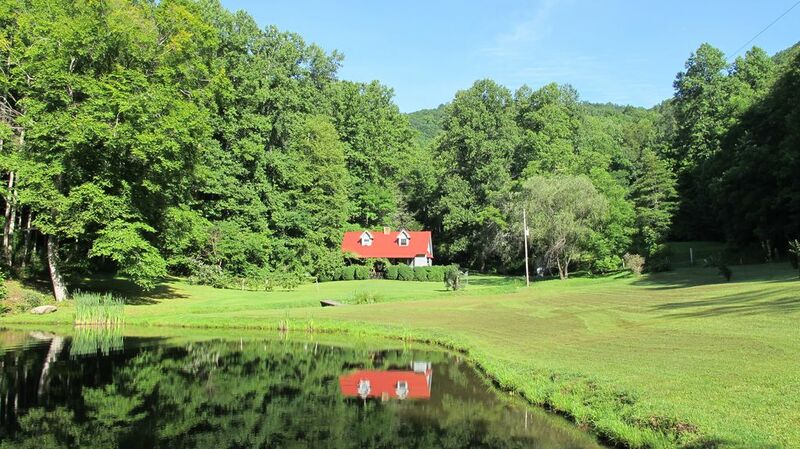 Driving times: Less than three hours north of Atlanta Less than two hours west of Asheville One hour and a half east of Knoxville Keywords: 117 Year Old Restored Farm House with New Metal Roof, 1 acre pond, and mountain branch that runs through entire property. Jimbo: Musician that needed to know the light at end of tunnel was not a train. Visited Western North Carolina many times over the years Had friends with property in area & felt at home. toilet, shower, Kinda like going to camp. Bath & hand towels provided. 53 acres border the Nantahala National forest. Beech Creek Mountain is seen from the front porch. On the edge of Nantahla National Forest. Pinhook Branch runs through the entire property. Front Porch faces private one acre pond. Pinhook Branch runs through property to 2 settling ponds . Great for creek stomping. Apple / Peach / Pear / Cherry Trees and Blueberry bushes in the meadow next to Pond. Front of house has Concord grape vines. 3 units in main house. One 14,000 BTU Floor Unit in Kitchen. One window unit in each Loft. 1- 12,000 BTU Floor Unit in Out Building. Oil Radiator heaters in Lofts. Eden Pure unit in Kitchen. Electric fireplace in Master Bedroom. Feather Bed & Winter quilts on Queen & Full Beds. Wood Pot Belly stove . Electric unit in master bedroom. Plenty of parking behind House. Hughes Net Dish Gen 5 Internet service. Stove was actually made at a foundry in Robbinsville MANY years ago. Works great. New queen size sofa sleeper, 1890's Morrison rocking chair, 1 antique ladies rocking chair. Pot Belly Stove. 1 standard drip & 1 perculator. Anything in pantry is in date & yours to use. Pots, pans, and cast iron pans in kitchen. Additional folding chairs in tool shed for use around fire it dinners. Sony TV with VCR in Out Building. Reference books on local wildlife. Guest leave all sorts of interesting books. Jimbo's PlayRoom . 8 Foot Brunswick Pool Table & dart board. Bean Bag / Corn Hole game of front porch. Brunswick 8 ft. slate table. Loads of DVD's & VHS tapes. 53 acres. Concord grape vines, Blueberry, Blackberry, peach trees, Black Walnut trees, and Apple Trees on property. Front Porch with 2 Hammocks, 1 swing, 2 Rocking chairs. Side Porch with 2 Rocking Chairs. Pot Belly Stove in living room, Charcoal BBQ, Electric Fireplace in master bedroom. Out-Building with Queen Bed, 1 Twin Bed, Bathroom with shower, Sleeps 2-3, Great for Kids! available at no extra charge. 14,000 BTU A/C Unit -1 main floor, 2 Window Units 5,000 BTU in Upstairs Lofts. Pets allowed with Security Deposit Hughes Net Internet service with wireless router Available. There are Cheaper places to stay, But none Better.